What will be the top kids toys at Christmas 2018? Want to know the hot toys for Xmas? See the top Christmas toy lists here first! 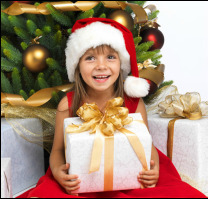 Each year, many of the main players issue a 'Christmas toy wish list' which details the top toys they think kids will want - and they want to sell! So, what's on their lists as top toys for Christmas 2018? Here are the lists we've found so far... click on the red ones for more details! Dream Toys for Christmas - coming very soon! What are the top toys for Christmas lists? Every year, major toy retailers try to predict what the top toys for Christmas will be from the thousands of toys available. In the past, these lists have usually been released as part of their normal Christmas toy catalogue, or tied with special offers in the weeks leading up to Christmas. For most toy shops, the season of list release usually starts with the Dream Toys for Christmas list, produced by the Toy Retailers Association and released in the last week of October or first week of November. However, over the last few years this pattern changed, with a select group of major retailers releasing their Christmas lists really early, starting with Hamleys Christmas in July event. BUT in 2013, things slowed right down with far fewer lists released, and even in 2017, there were not too many issued. We guess this was because stores didn't want to seem too prescriptive, leaving shoppers to buy what was in their budget rather than feeling pressurised to buy big ticket items. We'll pick the best Christmas toys lists as they are released, and research the toys carefully to give you full details of the hot toys for Xmas 2018 from major retailers such as Amazon, Toys R Us UK and USA, Tesco, Argos, Hamleys - and a few more unusual sources. Why do online stores release top 10 Christmas toys lists? Let's be honest here, online toy shops don't do it out of the goodness of their heart! Their toy buyers probably saw the toys first at International toy fairs in January, and probably decided what would be at the core of their Christmas toy collection by Easter. After all, they needed to order their toys from the toy manufacturers, who then have to have them made and shipped to the UK in time for the release of the Christmas shopping lists. Therefore, each toy retailer has a vested interest in listing the top Xmas toys that they have ordered, so their lists will inevitably be a little biased towards their own stock! Where all these Christmas toy prediction lists start to get really interesting is where they overlap, and you see the same toy appearing on several lists. This is usually a very strong indication that this is a *very* hot toy for Christmas! When do the top 10 lists get announced? The whole jamboree started in earnest in June this year, but often as press only events which makes getting hold of the lists a little tricky. It's all a bit confusing (not to mention exhausting) so we cut to the chase and wait for everyone to chill out and publish their predictions lists - it's much easier! How much do the top toys for Christmas cost? As almost every savvy shopper knows, the recommended retail prices of top toys for Christmas are not necessarily the prices you will have to pay. As Christmas approaches, every retailer tries to entice you to buy your presents and toys from them through special offers or discounts. Not every store will offer the same discount at the same time, and some online stores may never discount the toys that you want to buy, so keeping up with the best deals can be a nightmare! Don't worry - where possible, our Price Comparison panel compare prices for each Christmas toy from available online from UK retailers. Our price comparisons are updated automatically, so you can be certain the price you are looking at is the best price you can get from those readers retailers on the day you're buying. If toy retailers offer discount toys for Christmas, should I buy early or wait? We always suggest you buy your hot Christmas toys early for one very good reason; top toys often sell out very quickly. No parents needs to be reminded of the rush to buy the latest and greatest toy for Christmas, followed by the endless disappointments of driving from store to store trying to buy one when all stocks have been sold out. By buying from our selected toy retailers online, you can have all the hot toys for Christmas delivered direct to your door, without having to battle through city centre queues, crowded car parks, or freezing cold late-night toy shopping. You will also be able to get the best price going at the time of purchase, so you can feel very smug while other parents are panicking!